Breakfast this morning? Triple the almonds for an awesome bowl of oats! 10 minutes and breakfast is on…. 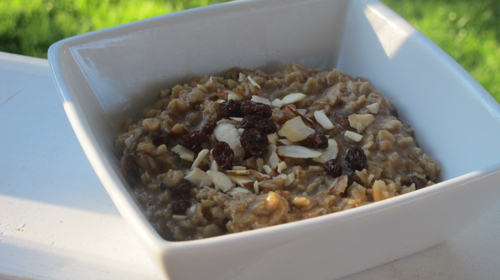 Add the milk, oats, raisins, maple syrup and cinnamon into a medium saucepan, bring to a boil. Turn to medium-low and cook for 5 minutes, stirring often. Take off the heat and add the almonds and extract, stir in. Dish up and top with more almonds if desired.